By day, Aimee Munford is a buyer for online retailer Need Supply. By night, she crafts the vintage-inspired pieces that make up her Garnett Jewelry line. 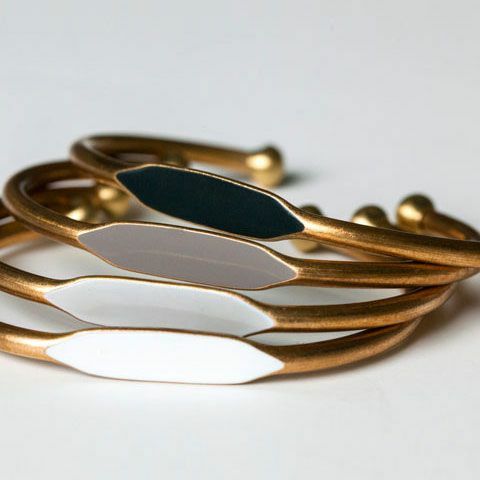 With its combination of hand-painted lacquer and brass, this set of bracelets has a retro touch. When stacked together, the ombré gradation is decidedly modern. Wear one alone as a subtle way to enhance your outfit or embrace the more-is-more trend by going with four at once. All of the pieces from retailer Of a Kind are limited to 100, so act fast if you want them. Garnett Jewelry ombré quartet bracelets, $84 at Of a Kind.